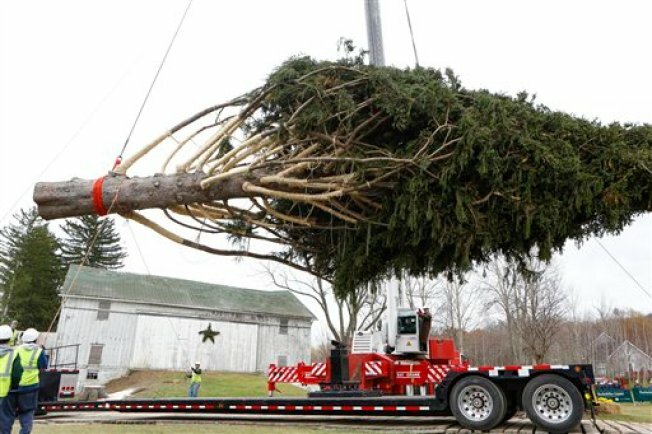 The 78-foot Norway spruce that will be the Rockefeller Center tree this year will be cut down Wednesday from a home in Ulster County and hoisted on a trailer to make its journey to New York City. The 10-ton tree will be cut down Wednesday from the Gardiner property of Albert Asendorf and Nancy Puchalski. It will be put on a 115-foot-long trailer to make the 80-mile journey to Rockefeller Center in midtown Manhattan, where it will be erected on Friday. The tree will be illuminated for the first time on Dec. 2 in a ceremony that's been held since 1933.